This year was the first time we tried our hand at pumpkins. We planted “small sugar” pie pumpkins. I’m not too sure what happened, but I think we had a little thief come and nibble on them at night; we only got these 3 to maturity this year! 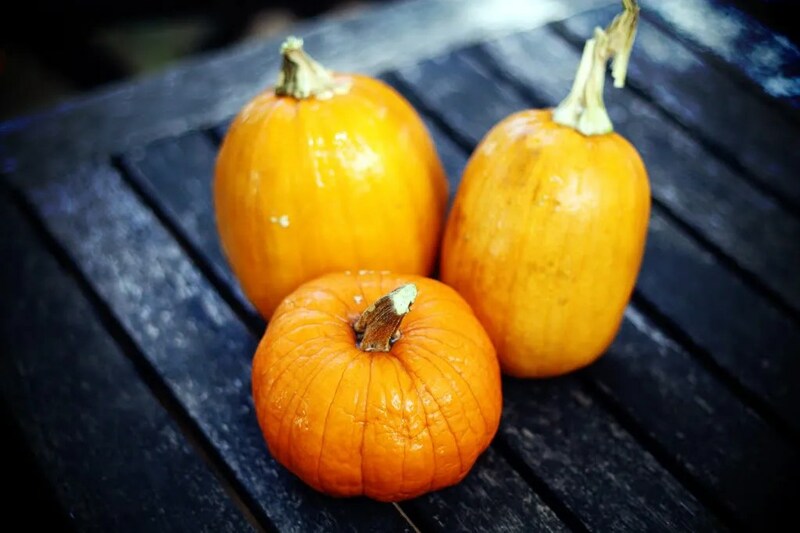 Pie pumpkins differ from standard “jack-o-lantern” pumpkins because they are less fiberous, are very dense with a deep orange flesh, and packed with flavor, which makes them perfect for pies, breads, sautees and curries. With these little pumpkins weighing in at only 5 to 6 pounds, they are well suited for growing vertically on something sturdy, like cattle panel; which is what we will do again later next spring, instead of letting them ramble all over the ground. I ended up cutting these three pumpkins in half, scooped out the seeds and gunk and baked them until they were soft, about an hour. I let them cool and scooped out the soft flesh and stored it in a Ziploc freezer bag to use in a recipe later. If you have any great gardening suggestions for growing pumpkins, please comment, I would love to hear your ideas!